The FMR1 gene is an example of how a single gene can have different phenotypic effects. Indeed, since its discovery in 1991 it has revealed new facets: classic Fragile X syndrome (FXS), Fragile X premature ovarian insufficiency (FXPOI), Fragile X tremor-ataxia syndrome (FXTAS) and other emerging disorders from which we are continuously learning more about this gene. The chapters of this book provide an update of the different allelic forms of the FMR1 gene. 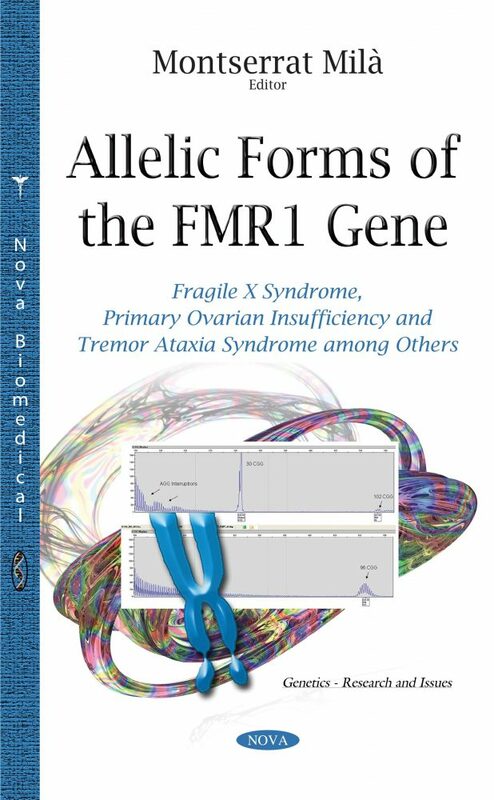 Chapter 1 is a description of the classical Fragile X syndrome including clinical findings in males and females, the FMR1 gene, molecular bases, the FMRP protein, animal models, genetic counseling, newborn screening and diagnosis. Chapters 2 and 3 review the two main disorders associated with FMR1 premutation: FXPOI and FXTAS. FXPOI is a new clinical entity in which carrier premutation (PM) females present early ovarian dysfunction, with menopause occurring 5 years earlier than non-carrier family members. FXTAS is a late-onset inherited neuropsychiatric degenerative disorder that occurs predominantly in male carriers of the FMR1 premutation. Chapters 4 and 5 present the most recent advances in the current knowledge of other disorders associated with the FMR1 gene: Chapter 4 describes the psychopathological alterations of the different phenotypes associated with either premutation or full mutation. Chapter 5 is focused on the pathologies associated with the premutation such as fibromyalgia, thyroid disease and hypertension, among others. A comprehensive review of genetic counseling is done in Chapter 6 including all types of alleles related to the FMR1 gene and point mutations.